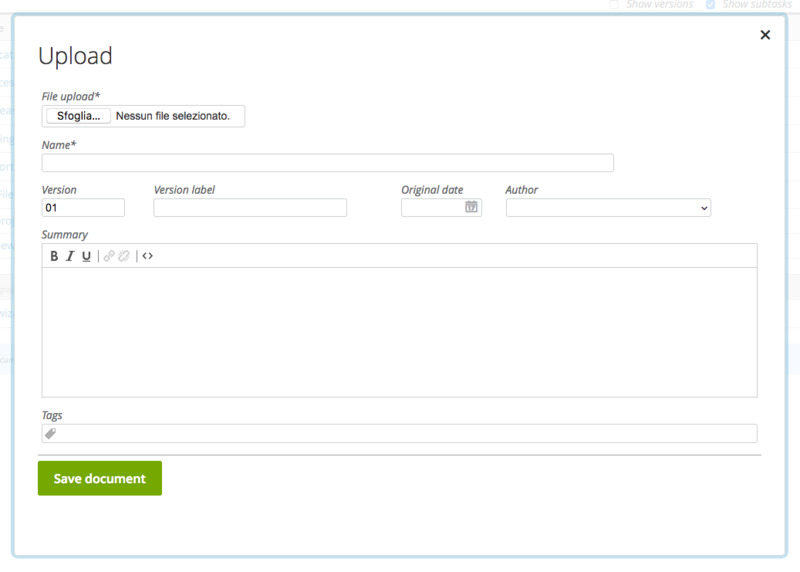 Every time you “drop” a document on a project (and resource, and issues too), Twproject save it on its repository. Twproject keeps versions of the same document, so if you upload a file with the same name twice, it generate a new version. Old versions will be still accessible. Drag and drop is the simplest way to upload document but if you want to describe the document adding extra information, like name, date, tags or abstract, you can use the full document editor. You can “lock” the document in order to avoid that someone uploads a new version while you are using it. You should lock the document while you are editing it. Once you finished your activities on the file, upload the new version and unlock it. Documents uploaded, will be will be full-text indexed, so that you can find projects or resources even using sentences found on uploaded documents. Twproject support all the most used formats like PDF, text files, Word, Excel, Power point and other office formats.